1. to spread the work of Pat Mullins. His talks, articles and stories which are available here in pdf and mp3 formats. 2. to raise awareness and be the primary site for the scholarship created in Beverly Mullins name after her death. The Beverly Mullins Memorial Scholarship was created to help single re-entry parents at UC Berkeley trying to earn their undergraduate degree. Take a look around, we have pictures, stories, talks and articles about Pat Mullins and information about Beverly Mullins and the scholarship. In 2008 our good friend Cris Mitchell took over 100 of my fathers talks, originally recorded on audio tapes from 1980-2000 and put them in digital format and cleaned up the quality of the audios. We owe him so much for doing that labor of love and want to acknowledge him here. Those talks are also on this site and available via mp3 format in the Life Work of Pat Mullins series. * originally published July 23, 2007. Updated in 2016. The Mullins family along with the UC Berkeley California Re-entry Alumni Chapter have come together to create a needs-based scholarship for Single parent re-entry students, doing full-time study at UC Berkeley. The Beverly Mullins Memorial Scholarship is in memory of Beverly Mullins, a 1998 Graduate from the Department of Sociology. 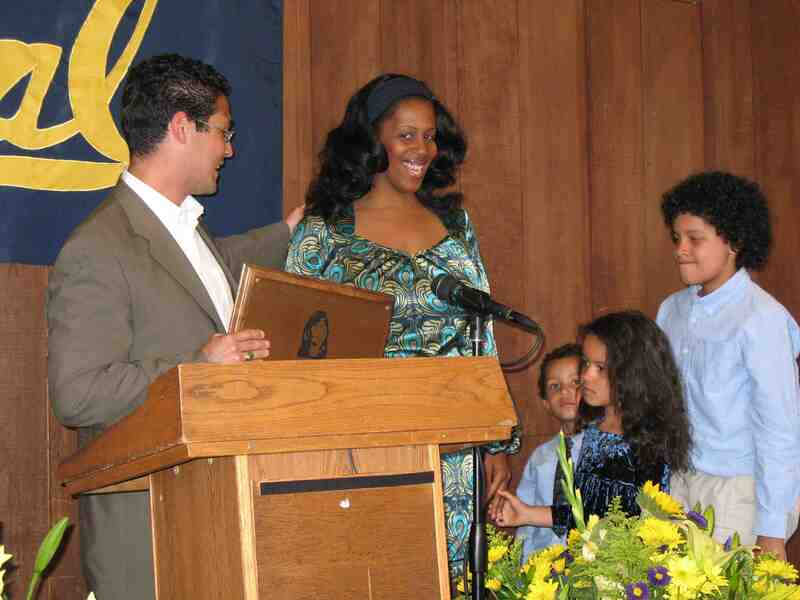 Beverly attended UC Berkeley as a single mother with no outside financial support. She was challenged to focus on both her studies and the responsibility of raising her son, Jacob. Today, Jacob is a graduate of Yale University, a testament to Beverly’s love, focus and determination to create, for him, a better life. The goal of the Beverly Mullins Memorial Scholarship is to help other single parents also achieve success for themselves and their families. More information on the family and the background of the scholarship is available here. This scholarship is currently inactive. 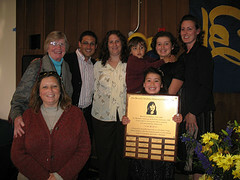 We have awarded 8 scholarships between 2001 and 2010. We have awarded scholarships to single re-entry students since 2002. The scholarship selection committee: Dianna Mullins, Helen Johnson, Jacob Mullins, Rudi Gewing-Mullins, RosieMarie Mullins and Nikki Dones. We are very excited to announce the recipient of a new scholarship my family has created, Shannon Swan an Anthropology major at UC Berkeley. The Future Women Leaders scholarship was created out of a need to help support future women leaders that are dedicated to empowering and/or giving back to women in their community or around the world. Shannon Swan inspired us 2 years ago when she applied for the Beverly Mullins Memorial Scholarship (BMMS) for single re-entry parents working on their undergraduate degree. At the time we had been considering a new scholarship, but hadn’t fulling lay the ground work for it. Once Shannon applied for the Beverly Mullins Memorial scholarship again, we knew it was time to officially announce the new scholarship and select her as our first recipient due to the work she is doing. I don’t yet have a bio on Shannon, but hope to soon! Follow her on twitter at @hominidsrus. 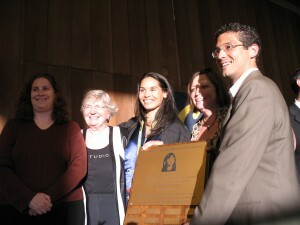 $5,000 awarded to full-time UC Berkeley student ! The UC Berkeley California Re-entry Alumni Chapter and the Mullins family have come together to crate a needs-based scholarship for Single parent re-entry students, doing full-time studay at UC Berkeley. The scholarship is in memory of Beverly Mullins, a 1998 graduate from the Department of Sociology. 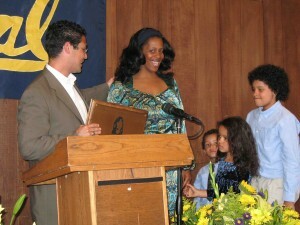 Beverly attended UC Berkeley as a single mother with no outside financial support. She was challenged to focus on both her studies and the responsibility of raising her son, Jacob. Today, Jacob is a graduate of Yale University - a testament to Beverly’s love, focus and determination to create, for him, a better life. The goal of the Beverly Mullins Memorial scholarship is to help other single parents also achieve success for themselves and their families. For more background on the scholarship, please visit other areas of our site. Three generations who truly believing that our world would always be what we had experienced since birth: unlimited possibilities, wealth with no limits, gold mines of opportunity in every direction, focus on ourselves, our families, our success. And then, as quickly as the seasons change, as when you think that summer will last forever even though you know it has to end, it does, and we are surprised. Surprised?! Surprised when a loved one dies. Embarrassed when a political race is watched by the world and our reputation as a nation is threatened yet again. In disbelief when our economy declines. Shocked when the gold mine has no more magic/fools gold to be found. Horrified when our nations soil, our nations people, are destroyed by those that have hated us passionately for so long because of all that we stand for, all that we have done. Amazed when a President whom many felt was disconnected from the people shows up, grows up, and becomes a leader. Humbled when we look to strangers for comfort and realize that they are not that different from ourselves. We are a collage of people brought together by a series of devastating events and forced to re-evaluate who we are, what we stand for, what we believe, and what is important. The “us” that use to include a select few, now encompasses a nation. Our freedom is threatened, our families have been torn apart and yet we find Hope - still. And so on this morning of Thanksgiving I sit quietly reflecting on the year. We, as a nation gather with our families, some of us with a new definition of what creates family. We are going to gather in a few hours with this family and we want to be Thankful. We are Thankful, through it all, we realized so much this year to be thankful for. We are no longer a nation of seekers for what we may never obtain but of doers for what is important today. We no longer expect that the world will be what it was but we are grateful for what it is today ??? not yesterday, not tomorrow, but today. The fool’s gold dust has been cleared from our eyes and we now see reality, and it is OK. The future may be uncertain, but we are no longer fooled into thinking that it was ever certain. The definition of “our” and “us” has changed, there is a focus outside of our immediate selves. The loss of the people will never be forgotten, it may never even be behind us, but we will learn to hold it dearly beside us, not to hold us back. As I write I have such gratitude for all that has occurred, not because it was all good. God knows that it wasn’t. But because I feel I have been woken up from a trance like state and forced to truly see the world, not just my small part of it, and begin to participate in it without blinders or rose colored glasses. To learn to serve others, not just myself. As many of you know, my father lived his life by the “Prayer of St. Francis” that is so simply stated but yet so complex to execute on. If I can learn to live a fraction of this prayer, that will be a miraculous gift given to me by my God, and yet I must always remember that gifts can only be given if we are willing to receive them. And so, my constant challenge is to always be willing to receive by constantly giving of myself. And with this reflection, I hope to give to you my love, gratitude and prayers for all of the support you have given me, because without all of you I would not be exactly who I am today. Many generations expectations of life have been redefined in this year, and this one small individual has seen it as a year of brokenness yes ??? but more importantly as a year of healing. Lord, make an instrument of your peace. Many people have asked me why my domain is so odd. These letters represent a phrase my father used for his last 20 years to help people understand how to live a happy life. Below is a direct quote from an article my dad wrote, but honestly its more than a “talk” or a “lecture” its a way of life. It took me years to fully understand the power of the words. I would sit in my fathers office complaining about “this situation” or “that person” and he would just listen until i was done complaining. Then, once he thought i was ready, he would slowly start sharing with me in a way that i could *hear* him about how to get through the situation, how to live my life. ?? ?The letters are from six scriptures the Lord spoke to my heart that are His process of the Holy Spirit revealing jesus in us - to us - and through us- to bring us to an AGAPE love in any / all / relationships. (I use a New English Bible)?? ?